Two indispensable companions are always with me on late-life trips across the seven continents. Leading the way is my excited-to-be-there, take-everything-in life companion. Can’t go without her. The other, more variable, is the book or two of history, memoir, fiction, poetry of the places we are exploring. 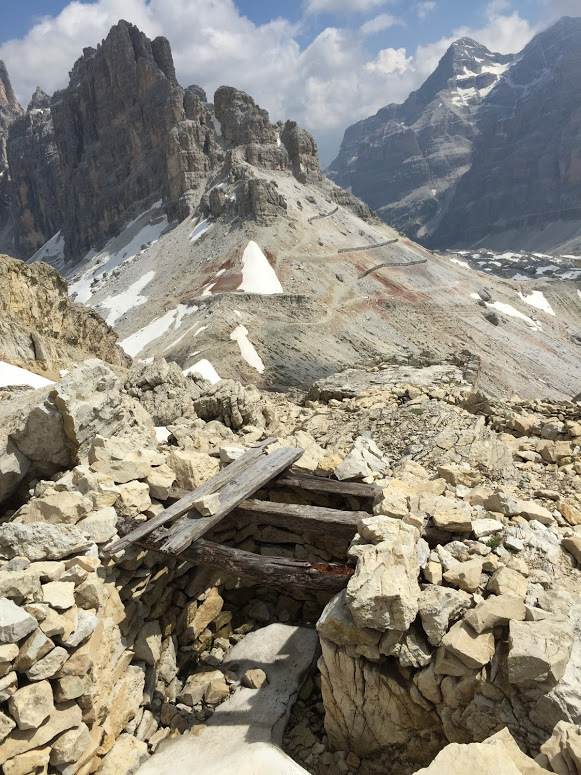 On a recent trip to Italy I was particularly interested in the Dolomite mountains on the northern border with Austria, stunning in photo and travel guide but also scene of some of the most costly fighting of World War I. My interest in the geography of war is not as a history buff of gore, courage and glory, tactics, strategy or diplomacy but as a war-resister. How is it that war has taken place in such and such a place and such and such a time, typically with so little resistance from those who will do the actual fighting? Since at least the French Revolution, armies have been formed with strong elements of popular participation, persuaded and led by those with social leverage surely, but in large part voluntarily and with initial great excitement. How do these men, and the women (until recently) in non-combat support, experience the desire to be in a war? Why are there so few voice resistance? How do feelings and judgments change as death becomes a companion? I’ve been reading journals, novels, histories and commentary on WW I since the 100th anniversary of its beginning on July 28, 1914. From the Dolomites I found a journal written by an Alpini officer, Paolo Monelli, which seemed promising. It was written immediately after the end of the war, in 1920, and published soon after with the title Il Scarpe al Sole. Along with it I read a fascinating history, The White War: Life and Death on the Italian Front, 1915–1919, written by British historian, Mark Thompson. Some chapters are about the same area in the Dolomites Monelli was in, while others cover the ferocious Austrian-Italian fighting on the Carso Plateau, the Italians trying to take, and the Austrians trying to defend, the important port city of Trieste. As it happens, we had been in Italy for ten days, walking the banks of the Arno in Florence, when the 100th anniversary of the Italian declaration of war against Austria-Hungary on May 23, 1915 occurred. In ten more days we would be in the Dolomites where some of the bitterest — and most useless– fighting had taken place. Paolo Monelli won’t be known to many Italian readers, much less American. Nevertheless, in his day he was not a man of little consequence. A world champion skier in 1913, when Italy entered the war — which he had agitated for– he joined the Celebrated Alpine Regiment and was later decorated for bravery several times. After the war he wrote for several newspapers, including years in Poland, Germany, Greece and Paris, and as a war correspondent when Italy invaded Ethiopia in 1935. During the Second World War, even though back in uniform, he continued as a journalist, often in battle zones. After the war, he was a journalist, acted in movies, translated and wrote several books. The first of twenty tree books to his credit, and perhaps best known, is, Le Scarpe al Sole, which, literally is “Shoes (or boots) to the Sun”, a soldier’s slang expression of the time to mean “dead.” The one English translation I’ve found opts for Toes Up. Monelli, in an afterword for the 4th printing in 1928, calls it his “war diary,”and says it is a smoothed together collection of notes he wrote from 1915 to 1918 during his time with the Alpine Regiment, and in an Austrian prisoner of war camp; he takes pride that there is no after experience re-writing or re-remembering; it is all what we might now call, “contemporaneous” notes. This explains the sometimes curious effect of reading what appears formally to be a seamless narrative, but which stylistically is a mix of descriptions of soldiers’ days, the terrain of the Dolomites (the Italian Alps), of soldierly grousing over command incompetence, (including a few bold sallies, unusual in texts of the time, and for which he apologizes in his afterwords,) remembered verses of song, lines from Dante’s Inferno, declarations of his own anger, sorrow and patriotic pride all decorated with flights of purple prose about the mountains, clouds, flowers and grasses, the experience of the great out of doors, when not under shell fire. Far less fictionalized than other similar WW I memoirs (Sigfried Sasoon’s Memoirs of an Infantry Officer, Emilio Lussu’s A Soldier on the Southern Front or Under Fire by Henri Barbusse,) it is both less interesting as a piece of organized and presented writing, and more interesting as a record of direct, in situ, responses to his experience. Unlike most published WW I soldier-writers, he his not driven by regret, or loathing or anything resembling an anti-war position. Despite passages about the fear, the cold, the whine of shells and friends dying, the three or so years, including several months as a prisoner of war in Salzburg, are recounted as somewhat of a young man’s adventure, as one might write today of an Outward Bound camp, a triathlon or a summer spent fighting brush fires. “There they were, in the distance, silver, from the green at the base all the way up to the clouds, snow-white, sunset-pink, sparkling with an infinite beauty. Newspaper writers, chief among them Luigi Barzini for “Corriere della Sera,” the powerful Milan based paper, who was almost as well known as General Cadorna or Prime Minister Salandra, wrote column after column of heroic adventure in soul stirring –and redeeming– locales. Until returning veterans brought real stories home, every newspaper reading Italian believed as Monelli did. The nature of the fighting in the mountains added to this retention of romanticism, quite different from the experience of industrial carnage, of being a cog in a machine, which the soldiers on both sides of the Western Front had, and indeed the Italians on the Carso plateau and along the Isonzo river had, fighting back and forth across the hot, “howling wilderness of stones sharp as knives,” trying to take, or hold, Trieste. 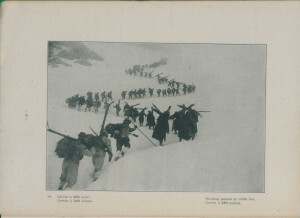 Fighting in the mountains was often in small unit combat, not large force maneuvers; it took skills and knowledge always part of mountain life — topography reading, climbing, sheltering, carrying– and so the whole experience was for many of them the “adventure’ Monelli tells us of in Il Scarpe al Sole. I read Le Scarpe al Sole, as I have all such books, to try to understand the motives and feelings of those who fought. What might we learn? How did they go to war, with reluctance or with happiness? What was their experience, of others and of themselves, under fire? How did they react to their killing of others, and how react to that reaction? Is there something in them, in the fighting, which is also true of those who declare and command the war? What can be conveyed, especially, to those young men (usually) who, before experience, conceive of war as a grand test of manhood, and a necessary passage into it? Thus, the value of the book for me: he has the virtue of honesty. As in all journal-based war writing, fictionalized or not, progress through time is linear from entry to the war, or training, through the march to the front, the baptism of fire, the comradeship of other men, the fear, overcoming the fear, the gruesome death of friends, through to the end of service — and in at least the case of Paul Bäumer of All Quiet on the Western Front, to death. Monelli uses no writerly techniques of flash-back, multiple narrators, or long philosophical, or background, excursions. There are however several mannerisms, of a time and place certainly, though reflecting a hasty, unmediated journal writing as well. Here, a favorite tactic, a stream of images, phrases without verbs, to speed the arrow along but which seem somehow flying askew, as if describing war in all its beauty. Description of cold and fear and battle occur, but often softened through a scrim of romanticism. “Zanella is coming too, with a bottle of wine. I don’t ask by what miracle he has found a bottle of wine on the ravaged mountain-side—but I fasten myself to the bottle-neck, and, lo, the red sun lights up again in my body. I am a good soldier again; a kick propels a reluctant man into the hole and flatters my cowardice. The men, spread along the ditch of snow, yell out their torment of the damned through the rattle of musketry. This sentence encapsulates his out-of-register language, poeticizing the terrible experience, yet intriguingly inventive. The translation by Orlo Williams, and published by Harcourt, Brace and Company, 1921, is serviceable, if not remarkable, with not a few instances of language aged by the years. Williams tells us in the preface that Monelli wrote to reflect a certain Alpini dialect, almost impossible to convey in English and that therefore he has picked a “neutral, soldierly slang.” It’s not too bad, but I always wonder when certain Americanisms like “pow-wow” and “dough” (for money) come from the mouths of Italian troops. The closing pages, written after he had tried twice, unsuccessfully, to escape an Austrian prison in Salzburg, and has been demobilized from the army, still rings, for all his hardship, with the thrill of the adventure and disdain for those who avoided it. “It is right that those who were not with us should try to belittle the war, should talk of war-psychosis, should take advantage of the rapid wearing out of the words “hero,” “khaki,” and “trench,” and should prefer to consider the war a vast four years’ lunacy from which their wisdom kept them well away. But we who know how much they cut off their own lives will only pity these mutilated beings, who make a noise, perhaps, only to cover their remorse, who seek each other’s company and count their heads, taking courage from numbers to deprecate the stronger. Nor will we boast of our deeds, nor will we provoke them. Would you hit a blind man because he does not admire your picture? A gulf separates us, which no communion of faith and no community of interest can fill. It turns out a film has been made of Le Scarpe al Sole, 1935, as well. It doesn’t get high marks on Italian movie sites, principally because of its bravura treatment of the men happily going off to war — which you can see a bit of in this clip. The filming locations are mostly in Belluno, Veneto, Italy, where in fact much of the fighting took place, and which has a particular interest for me as I was in nearby mountains, while reading the book. For a few more, see Google +, here.